Long live the tiny neighborhood bookstore. In many places outside of major cities, small bookstores are a thing of the past. Remember You’ve Got Mail? Meg Ryan closes up her mother’s family bookstore, no longer being able to compete with megastores like those owned by Tom Hanks. Meg finds love but not all small business owners are that lucky. Big box stores, Amazon and the rise of e-books have pushed increased volume and cut prices to successfully diminish the hand-to-hand book selling business. In Hoboken, among the fast food windows and college-style bars, there are not one but TWO bookstores. Symposia, a bookstore and community center, is located right on main Washington Street. Rows of books are lined up on the sidewalk displays and I’m guilty of having stopped a number of times to run my fingers over worn titles as if recounting names of old friends. Only after doing a quick Google search, I realized that Symposia is also a “public benefit nonprofit corporation organized and operated exclusively for educational and charitable purposes.” What’s not to love? And it was in this bookstore where my mother found a gently used copy of Jonathan Safran Foer’s Eating Animals. I had successfully avoided reading Eating Animals since its release in 2009 while I was a sophomore in college. The title itself seemed aggressive, like a vegan was screaming at me from a megaphone, “Do you see that girl Katelyn? She’s EATING ANIMALS!” With all my sustainability classes focuses in biology, ethics, and philosophy, I couldn’t stomach yet another example of how humanity was royally screwing up the planet. So here I am, halfway through the book, completely immersed. Jonathan Safran Foer is a fiction writer who set out to answer a personal question, “What should I feed my kid?” His question is so simple and so without an agenda that the reader cannot help but grab his extended hand and follow along. I won’t go through his quest or quote his many gasp-inducing statistics about the process of eating animals except to say that he seemed to wrestle with the same questions that were rolling around inside my own head. As I read Eating Animals (on the subway, in the lunch room), I can’t help but think about the path that led us from a hunting and gathering society to one of mass produced factory farms. We have grown exponentially in population and our appetite for all types of delicious beef, pork, chicken and turkey have grown beyond comprehension. We want cheap meat all the time and have found a solution to satisfy our needs (wants). Today, we would be physically unable to eat the quantity of meat we do if animals were raised and killed in the methods from a century ago. Small barns to factory lots. Store front to big box stores. Like the meat industry, I wonder if we have subconsciously chosen “factory farmed literature” over small independent booksellers. Internet giants like Amazon have indeed cut into profits from the likes of Barnes and Noble and Borders (RIP). To my immense surprise, it seems these smaller bookstores are making a vibrant and profitable comeback. Once again, the reader is seeking a community they can see and books they can feel with their own hands. Customers are consciously choosing to walk into a small bookstore and buy a new find, before devouring each physical page with a hunger and need for the written word. I fear this connection and active voting with both our minds and our wallets will not translate over to another industry that has grown much beyond proportion and comprehension. The average American eats 21,000 entire animals in her lifetime. Our insatiable American appetite is fueled by two day shipping, cheap books and cheaper meat. During the summer of 2011, I spent three magical months in a southeast Asian island nation that has recently made its way into newspaper headlines and radio interviews. The Philippines was the place I learned to scuba dive, eat fertilized duck eggs, and formed friendships that have continued long after my return flight home. It is a country of beauty and unyielding hope for a better tomorrow. There are a number of organizations currently receiving donations. Due to poor infrastructure and limited transportation, cash donations are preferred for those living outside of the Philippines. Help Malapascua – Stay up to date with the region’s relief efforts. 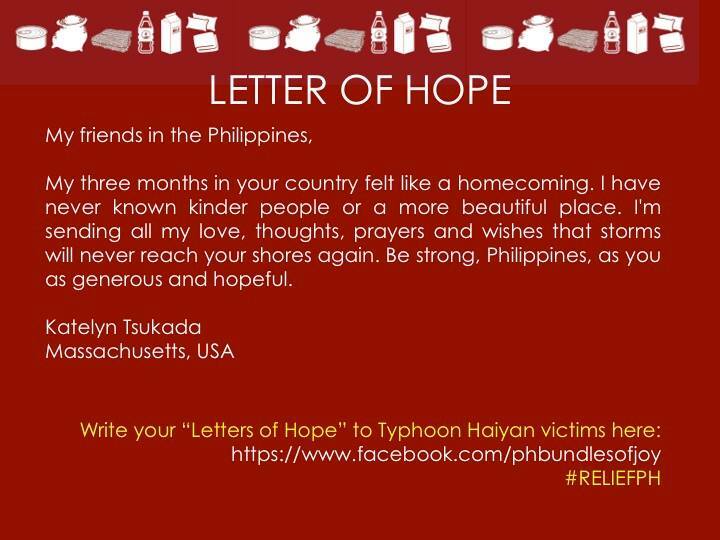 Bundles of Joy – Write a letter to show your support. Adopt a Town for Christmas – Find a list of reputable organizations with people on the ground. Contact information and donation pages are available. Develop creative yet plausible answers when asked by friends and family why I am still single. Pick an outfit that simultaneously implies “boyfriend worthy” while incorporating an elastic waistband. Spend 24-48 hours directly follow the Thanksgiving meal simultaneously impressed and mortified that my body consumed as many calories as it did. But I must consider another point on my list of Thanksgiving “to-do’s”– eating and celebrating sustainably. Here are 5 ways to be sustainable on November 22. Buy local: Who doesn’t want that personal connection between farmer and consumer, smiling as loose bills and parsnips exchange hands? Participating in CSAs (Community supported agriculture), farm shares, or the occasional stop to the farmer’s market benefits the local economy and supports the agriculture in your geographic region. Or prepare now for next year and harvest carrots and potatoes from your own garden! Eat seasonally: This is more difficult for us Northeastern folks who exhaust the ways root vegetables can be cooked, sautéed, broiled, boiled, roasted, blanched, and pureed. Increasing your awareness of growing seasons however, can make a huge impact on your carbon footprint. Brussel sprouts, served with caramelized butter and maple syrup, were picked 20 miles away and taste incredible. Compare them to store-bought berries or tomatoes and chances are they were flown to your table from Florida, picked before they were ripe in order to make the 1,150 mile journey. Go to the Source: I am the biggest culprit when it comes to canned goods. Baking, cooking you name it. Last month, I made muffins with a can of Trader Joe’s Organic Canned Pumpkin. Organic yes, but the pumpkin I used came all the way from Willamette Valley in Oregon. Definitely NOT local. Recently my housemate Julie made a pumpkin pie with pumpkins from a nearby farm stand. 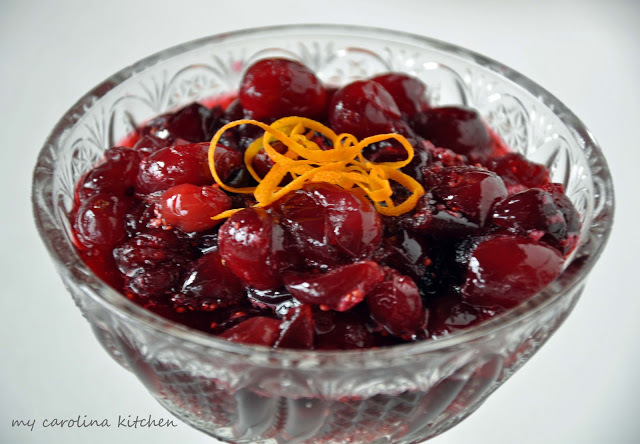 She roasted them on a baking dish and scooped out the softened orange pulp. 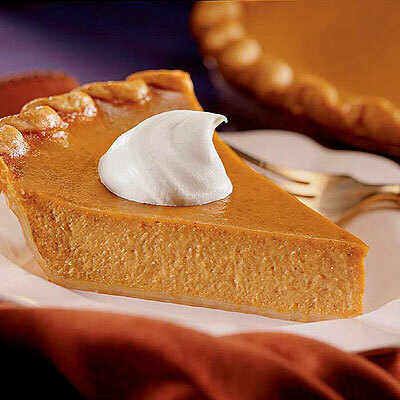 The finished product was lighter in color than traditional pumpkin pies but had the most amazing flavor. 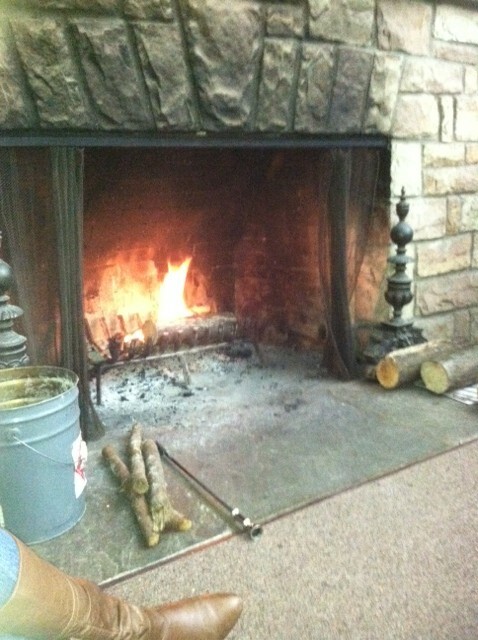 So try roasting your own pumpkin or making homemade cranberry sauce. And don’t forget to toast the leftover seeds for a delicious snack. Mind the meat: It’s true. Raising animals for food takes an incredible amount of energy and puts a significant strain on the planet. And while I don’t expect every family to go vegetarian, consider decreasing the number of meat dishes on the table. Do you really need a turkey, ham and mini hot dog appetizer? Experiment with new, delicious veggie recipes that leave your guests feeling fully satisfied and less stuffed at the end of the meal. Still need your turkey fix? 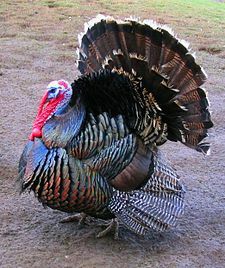 For the past two years, my mom has reserved a Thanksgiving turkey from a local organic, free-range farm near our house. The sticker price is steeper than a traditional Butterball, but the externalized impact from animal cruelty, mass production, and added preservatives makes our local bird a no-brainer. Plus, available websites like EatWild and Local Harvest now allow customers to type in their zip code and find sustainable farms locally. Spread the love: Sustainability extends beyond our dining room table. Many food pantries and homeless shelters provide Thanksgiving meals served in-house or deliver meals to those who cannot afford the luxuries we take for granted. This season, consider purchasing produce or canned goods to donate to your local pantry. I remember in high school, my friends and I drove around the area dropping off baskets of stuffing, gravy, cans of beans, pie crush and turkeys. We gave thanks by extending our love and fortune to those who were struggling to make ends meet. So there you have it folks. Take a moment to consider the environment while preparing this Thanksgiving. Stuff your faces and be thankful for everything, every person, and every good thing in your life. Go forward with a loving heart, a reflective mind and full stomach. I often define my friendships by conversations. Past jokes, heated debates and the stories act as landmarks along my living timeline. I converse to connect with others and to mutually share internal thoughts. But what about the moments in between speech? What about the silence? My friend Juliane and I arrived late Saturday afternoon at the Arcadia Wildlife Sanctuary just off Route 5 in Easthampton, MA. Despite the beautiful weather, it was too far to walk so I drove with the sunroof open, arms dangling in the warm breeze. Our day, until that point, had been stimulating: an estate sale, lunch at the delicious vegetarian-friendly Green Bean and shopping downtown at FACES for new sunglasses and a bed spread. I believe it was the way a Saturday should be spent, free of any responsibilities but the enjoyment of tag sales, sunshine and the closeness of a friend. 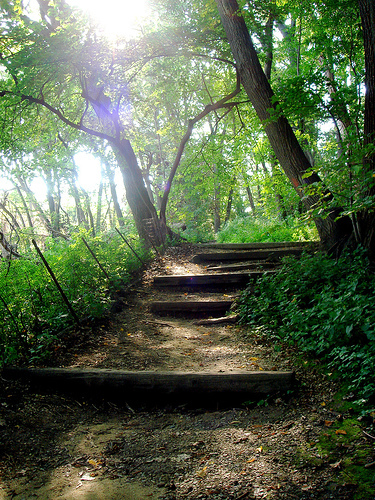 A stroll through nature seemed like the logical next step. Quite literally. I parked the car and we ventured off, the crunch of gravel giving way to the muffled paw paw of the earth beneath our sneakers. Particles of dust floated through beams of golden light as the path led us away from the parking lot and into the trees. Our conversation slowed and tapered off, lost in the softness of young pine needles and patches of shy green ferns. Silence crept into the space between our bodies and our thoughts. We walked on. I don’t remember how long we walked or who eventually broke the silence. Eventually, the cadence of our voices rejoined as we reemerged into the sunlit field. I was struck by the natural quality of our silence–void of panic or fear to fill the space with meaninglessness. We had walked together but our thoughts had moved independently, weaving in and out of conscious thought creation. We were worlds apart and an arm’s length away. I wish the same for you and your friends going into the future. The silence might appear suddenly–at the dinner table or in the moments before a goodbye. Do not be so quick to fill this space, it is not empty but full of depth, mystery and internal questioning. 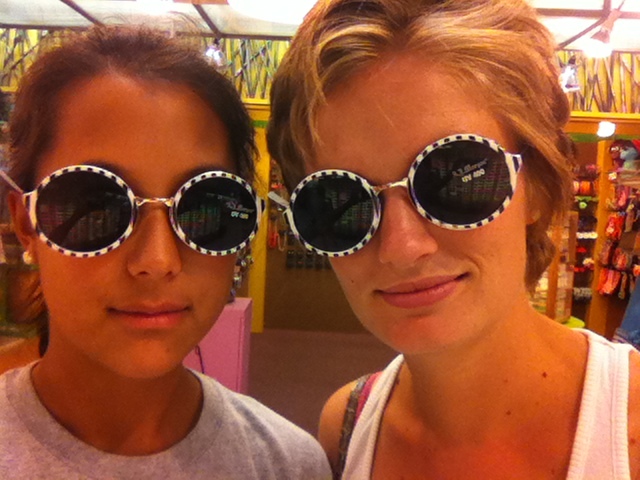 Define your friendships in the things unsaid just as you define those moments in the things that are. As close in the silence as in speech. We all have passion. It is this passion, this innate hunger, that drives our actions and fuels our path in life. For some people, the passion is clearly realized in a job career or series of business practices. For others, the passion is less known, centered around travel or care for immediate family members. 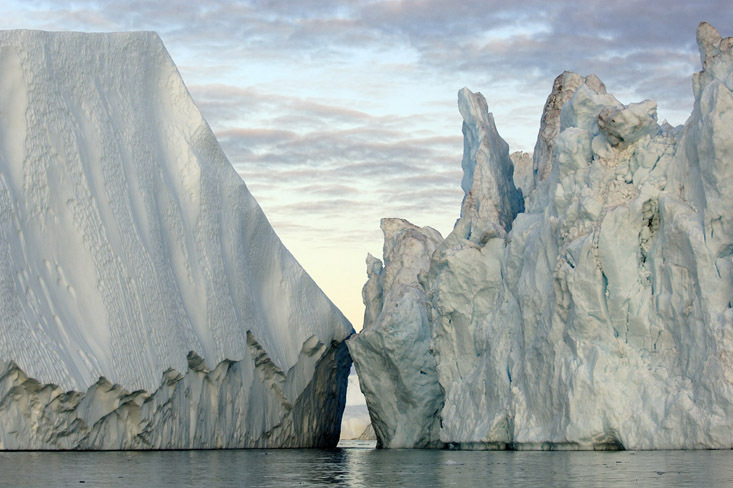 For James Balog the original passion, that of photography, grew into a cause much greater than himself. Through his work, Balog has inadvertently inspired others’ passions with renewed adrenaline and purpose. 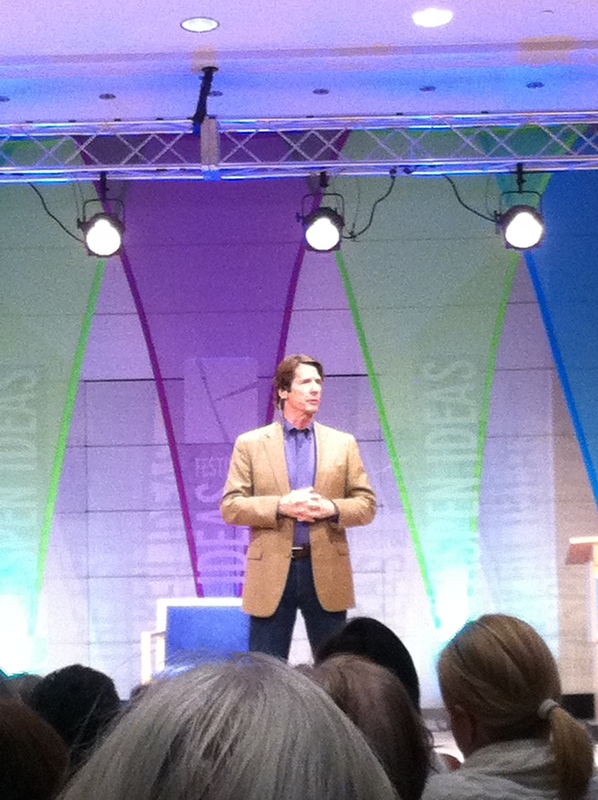 James Balog and the documentary Chasing Ice appeared at the Aspen Ideas Festival just as we arrived in Aspen from our 5 hour shuttle from Denver. 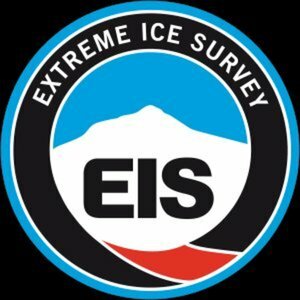 The film, directed by Jeff Orlowski, followed Balog and his incredible team during the trials, tribulations, and revelations of the Extreme Ice Survey (EIS). The survey’s mission? To install time-lapse cameras in various Arctic locations to document the changes in glacial retreat. The film, which premieres nationally in November, received the award for Excellence in Cinematography of a U.S. Documentary at the Sundance Film Festival in January 2012. The footage will floor you. James Balog, an original climate change skeptic, is leading the movement to educate people on the reality of a changing planet. His haunting photographs show dramatic changes of 15 different glaciers vanishing more rapidly than they ever have before. Through Orlowski’s cinematography, audiences bear witness to glaciers the size of skyscrapers tumbling into the choppy frigid waters, never to be seen again. My instinctual reaction-hand over mouth, eyes wide-revealed my shock when I first saw the beautiful yet devastating images on the screen. The audience reacted similarly and Balog’s presence onstage was greeted with a standing ovation and reverent applause. “I think the bigger place where this change is going to play out is on the level of local governments and consumer choice,” Balog said when asked what audience members could do for the cause. Even my college roommate, who is neither an environmentalist nor avid glacier enthusiast, talked about what she could do to help decrease the impact of climate change in her daily life. The film fueled the desire for action, for instruction to slow the dramatic changes occurring in the Arctic; previously apathetic individuals standing up and asking how they could do more. The documentary makes up a small part of the larger fight, a fight of modern environmentalists across the globe to change minds and evoke action devoid of political debates, biased media coverage and radical activists. Caring about the planet and about the environment is a universal responsibility. No individual wants to see their house destroyed by fires in Colorado, ocean level rises in Bangladesh or heat spells in Washington D.C. The movie Chasing Ice is just one look at the implications of human actions on the earth and as a collective, we must face the future with more than shuffling feet and eyes blindfolded by nervous denial. 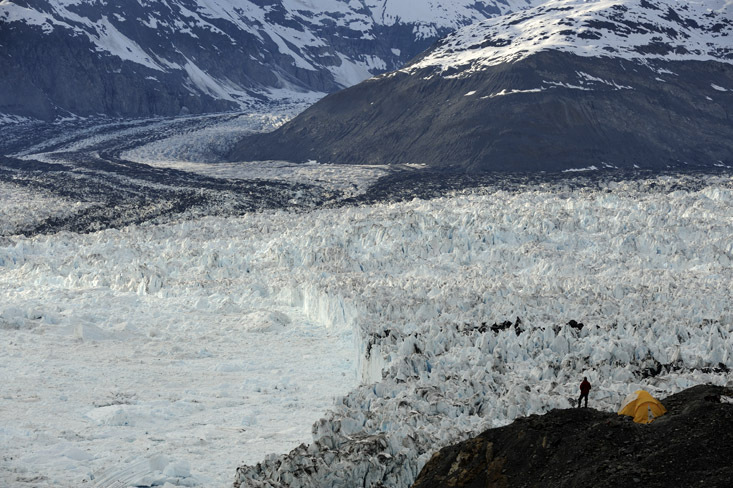 Columbia Glacier in Alaska has retreated 2.3 miles since EIS began and 11.3 miles since 1984. Hiking can be intimidating. First there is the gear: Camelbak packs or Nalgene water bottles, Columbia hiking boots , the North Face wind resistant pants, and obscure maps with contour lines like thin strands of hair marking the receding elevation. You need necessary snacks, torn between Cliffbars, trail mix, and varieties of dried fruit that you imagine other experienced campers eat on a daily basis. One must also choose the location. Do you travel long distances to the Rocky Mountains or attempt to navigate the trail behind your house in upstate New York, hoping your deer hunting neighbor will not mistake you for a young doe. Of course, the real fear is not the brand names of waterproof clothing, the food or the specific location of the trail. It is nature itself. Weather is unpredictable, bugs are prevalent, and Googling “beautiful nature views” takes a fraction of the time it takes to actually go out there yourself. But stop for a moment and think. Think about the most beautiful sight you have ever witnessed or the most beautiful place you have been. How many of those memories took place in nature, watching the sun slip behind the gently rolling waves or smelling the violets on the first day of spring? We have become so removed from nature that outdoor adventures are increasingly unknown and dangerous experiences, saved for mountain men and expert campers. Go ahead. Reclaim nature for yourself. My college roommate and close friend is not a hiker. While Jen is outgoing and very athletic, her favorite experiences in nature are laying on the beach and reading a good book. 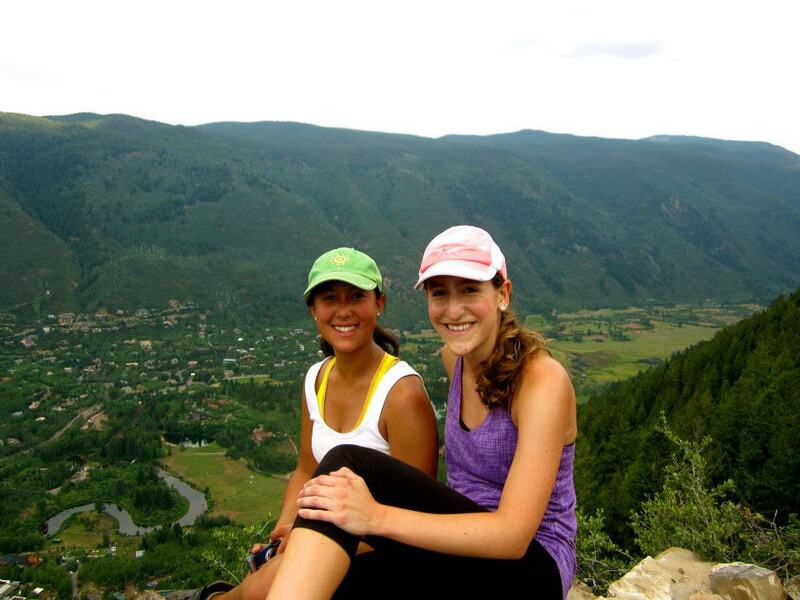 However, she dressed the part and was more than willing to try a number of hikes during our week in Aspen. 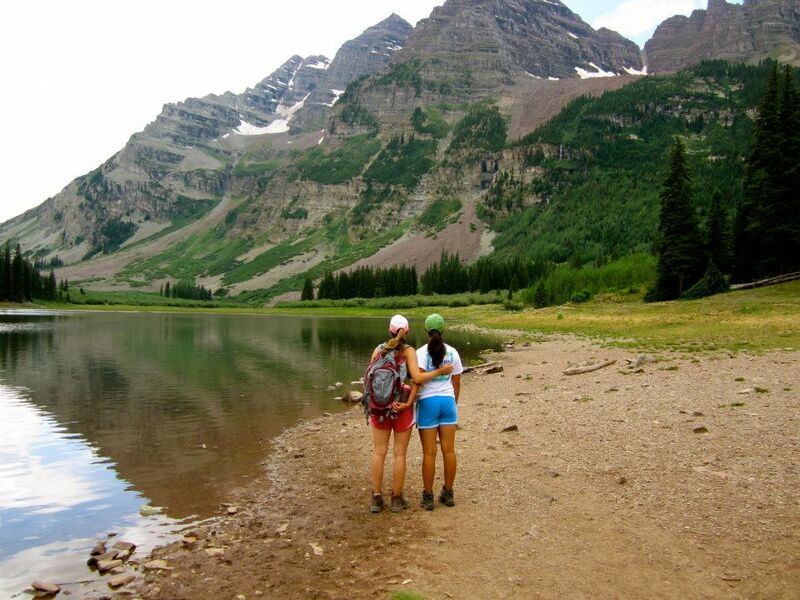 The Maroon Bells are some of the most photographed mountains in Colorado. Towering over 14,000 ft, they are a magnificent sight seen with ice patches at all times of the year. Jen and I did the Crater Lake Hike get a special view of these natural wonders. 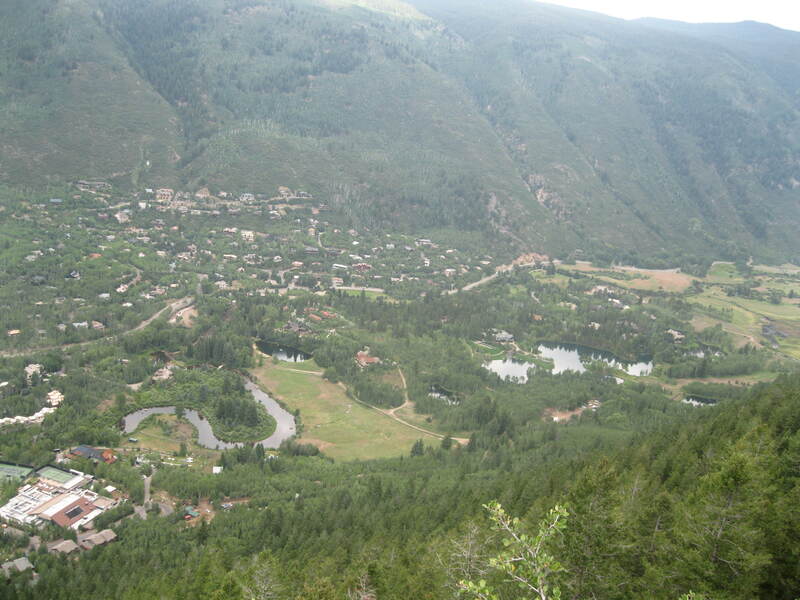 The 3.6 mile hike was a moderate trail, taking less than 2 hours. Our pictures were spectacular and our memories were unforgettable. Two days later, I attempted Aspen Mountain which begins at the base of Little Nell and climbs 3267 feet up the Aspen Mountain ski area finishing at the Sundeck Restaurant at an elevation of 11,212 feet. The benefit of such a climb other than the incredible view is the free gondola ride, bringing you safely down the mountain back to where you began your journey hours ago. 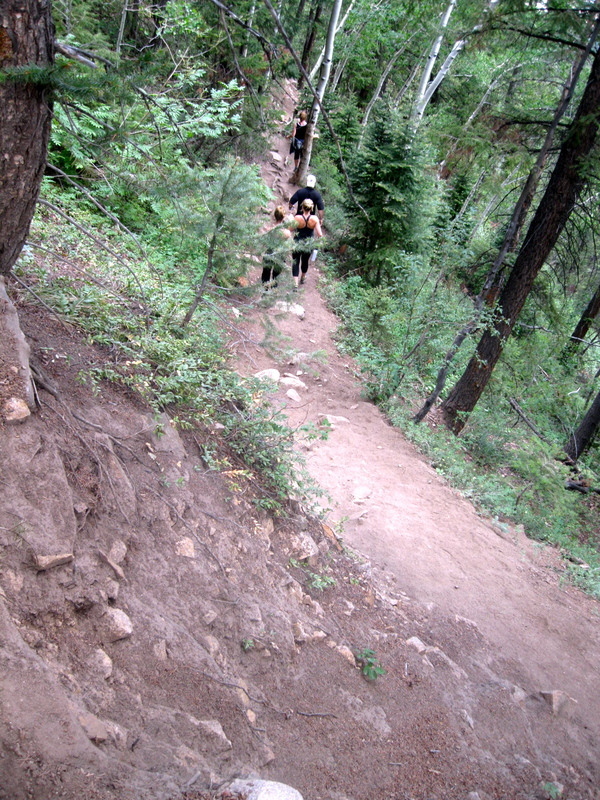 Our four person group became two about halfway up the steep ascent. The combination of unyielding vertical climbs and high elevation made me question my sanity and physical conditioning more than once as I continued to the top. Many Aspen locals and expert athletics jog up the mountain for exercise, racing during the America’s Uphill spring ritual. Who are these people with the lung capacity and mental stamina? In my mind, they tower over me like gods with large wings and a golden aura around their dusty running sneakers. Most of us will never reach this caliber of hiker/jogger/athletic extraordinaire. But each of us can look on a map and pick out a trail that is right for them. Look for opportunities locally. Hike a mile to a nearby waterfall or walk through your local bird sanctuary with a bottle of water and a pair of binoculars. The natural world has sights, sounds and wildlife for everyone to experience. 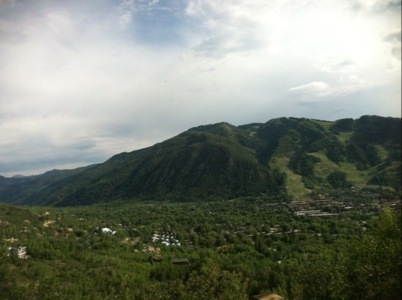 Even if you don’t want to run up Aspen mountain. The shuttle from Denver International Airport took us along I-70 heading west before rumbling through Glenwood Springs and curving south along 82. 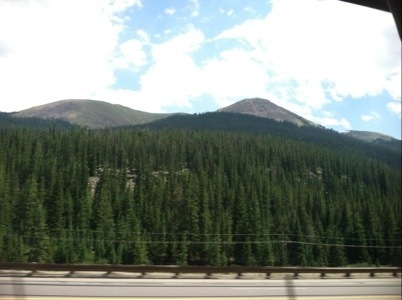 We past the red hills of Basalt and winding mountain passes in Snowmass, blurring past the windows of the Colorado Mountain Express. By 5:30pm, we had reached Aspen with a towering natural landscape and 8,000 ft elevation that quite literally took our breath away. I imagine the air in Aspen feels the way it wants to be felt: lighter, cleaner, and away from smog clouds and gas exhaust. The people here seem to feel it too. Families ride bikes along quiet neighborhood streets where pedestrians always have the right of way. Aspen’s downtown center is filled with upscale restaurants and luxury clothing brands, connected by cobblestone walking streets and outdoor seating. The grassy park in the center of the city is framed by looming mountains to the north and the south, regal protectors of the idyllic scene. I couldn’t help but marvel at the newness. I’m not in Kansas anymore. Empty dorm room. Unknown roommate. Campus map. Detailed yet confusing daily schedule of events. For just a moment, I am transported back to my first day as a nervous college freshmen anxiously lugging my bins of shoes and clothing up two flights of stairs. How do people make friends? Where are my classes? Did I brush my teeth this morning? But in my current scenario, it is four years later and I am settling into my room at DeSales University. Reason? Energypath 2012 conference on sustainable energy. 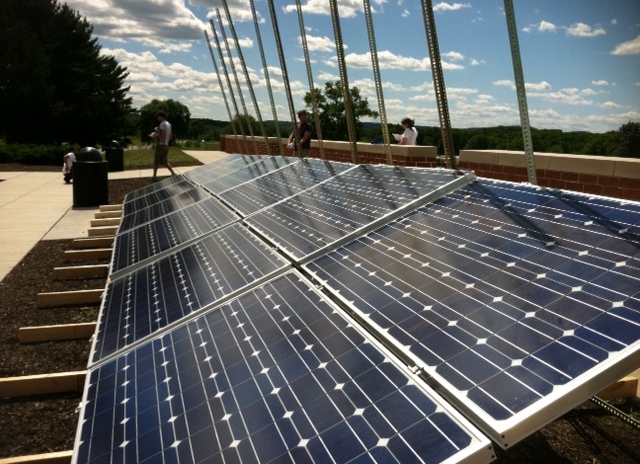 Energypath 2012 is funded by the Sustainable Energy Fund,a private non-profit focused on energy efficiency and education in the state of Pennsylvania. The conference brings together students, educators, and industry members in the field of renewable energy to discuss available options for sustainable energy and educates participants on the steps required for an energy path for the future of the country. The three-day workshop and two-day conference include hands-on educational seminars and keynote speakers by renown experts in their field. This year’s speaker was William Kamkwamba, the author of The Boy Who Harnessed the Wind–an autobiography about building a electricity-producing windmill in his home country of Malawi at the age of 14. His TED talk can be found here: How I Harnessed the Wind. I spent the first three days in one of the energy bootcamps: Solar PV (photovoltaics). Tables were filled with college students, homeowners and experienced professions with a vested interest in the value of solar energy. As our instructors flipped through slides on wiring, installation, electric currents and incentive programs, questions flew about the ideal wiring size and difference between a main inverter and a series of microinverters. I sat between my electrical engineering friends and quickly realized my liberal arts education had not adequately prepared me for the technical discussion that seemed to be boring my peers. We ventured outside to assemble our own solar arrays in small groups. There was a Penn State engineering student, a zero emissions homeowner, and a retiring/unemployed mechanical engineer. 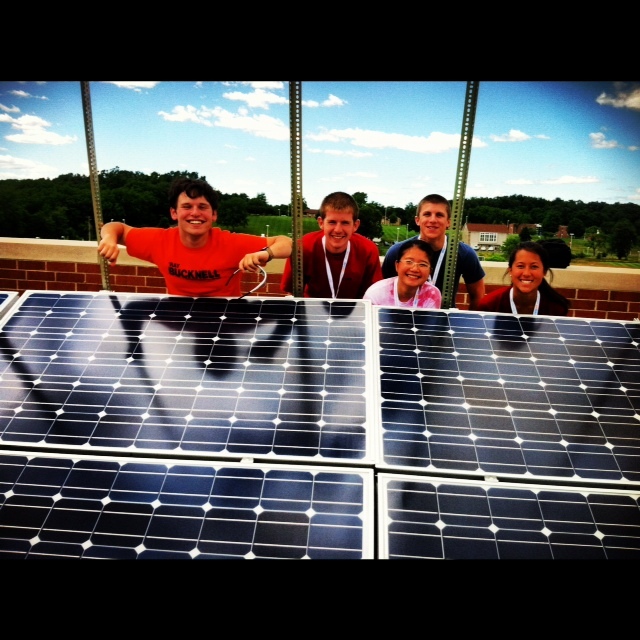 Together, we built the ground mount and attached the solar modules, mirroring the other eleven groups on either side. By the end of the camp, our assemblage of solar arrays was channeling energy through the inverter and into the grid. I was impressed with our ability to harness the sun’s power and even more impressed with my growing knowledge of AC/DC and the difference between a circuit in series or in parallel. Thursday and Friday were jam-packed with speakers representing sustainable energy companies, nonprofits, and universities. We heard from supporters of nuclear power, wind, solar, biogas and natural gas. Lutron explained the immense energy-saving power of light dimmers. Honeywell broke down a commercial energy audit. 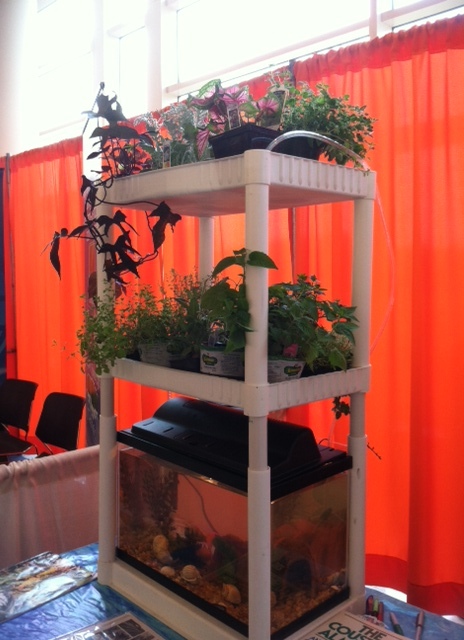 One woman presented the self sustainable system called aquaponics with the ability to provide fish and vegetable supplies to developing countries. John Jimison from the Energy Future Coalition believed a growing consensus among the American public would drive renewable energy as a realistic solution for Congress in building future policy. We all have ideas. Ideas that spin and jump and dart in and out of the conscious confines of our minds. 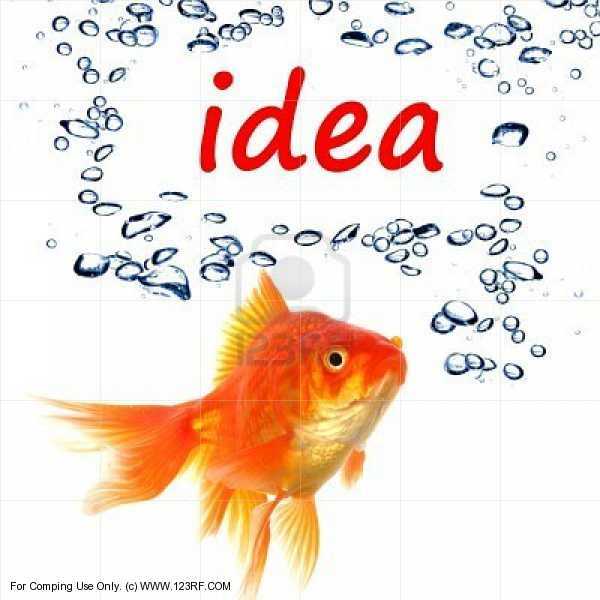 For me, most of these ideas have the lifespan of a fish bubble. They are tiny pockets of gas that ascend rapidly, gaining size and speed until they reach the surface with a triumphant pop…before disappearing back into the aquarium of lukewarm water. How many new year’s resolutions would be kept, charities created, and dream careers acquired if we held on to our little bubble ideas? I wonder what would happen if we didn’t shake our heads quite as much, acknowledging our newest inspiration as “just plain crazy”? Well this is my bubble idea turned reality. I got thinking about all the interesting and dedicated students who have a passion for the environment. Environmental Studies as a major has grown astronomically in popularity and I don’t see that going away any time soon. Our generation is already dealing with climate change, threatening weather patterns, increasing population, and decreasing food supply. We are the future leaders with the responsibility to look toward the future and turn international conversations into realistic action plans. I came back to school in the fall with a thought. Why wait for leaders of the world to come to an agreement on the energy crisis, CO2 reductions and policies on sustainable development? Change can just as easily start with the youth in America as anywhere in the world. 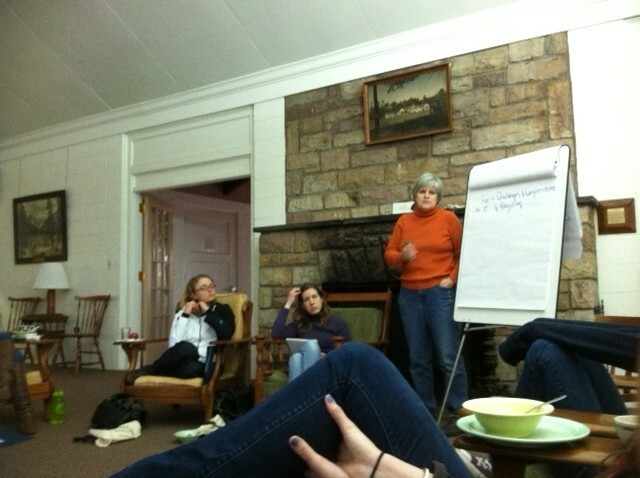 And so, with the tremendous help from Cathy Myers, the executive director of the Bucknell University’s Environmental Center, and Carol High, the program support coordinator, the 2012 Student Environmental Retreat was born. What: The retreat is a two-day event where students have the opportunity to present and exchange a variety of environmental programs currently working on their college campuses. Students and faculty advisors share ideas and create individual campus-specific action plans to implement at their home universities based on the projects discussed at the retreat. Where/When: Bucknell University’s Conference Center on February 11th and 12th. I uploaded the Invitation Letter and Proposed Agenda for easy reading. The application can be found here and the deadline is January 20th 2012. Contact me if you have any questions or concerns regarding the content or deadline. I highly encourage any undergraduate student who attends one of the aforementioned schools to consider attending. If nothing else, the retreat is a great way to meet people who are similarly dedicated to your own goals and aspirations. Want to change the world? The time is now. Well the time is actually February 11th and 12th but you know what I mean.